December 3, 2018 By Denny Hansen & filed under All Articles, Rifles & Carbines, Weapons. Big Horn Armory AR500 as it ships from factory. AR500 as tested with EOTech scope, TangoDown bipod, and SureFire Scout Light. Right side of receiver shows ambidextrous bolt release and safety. 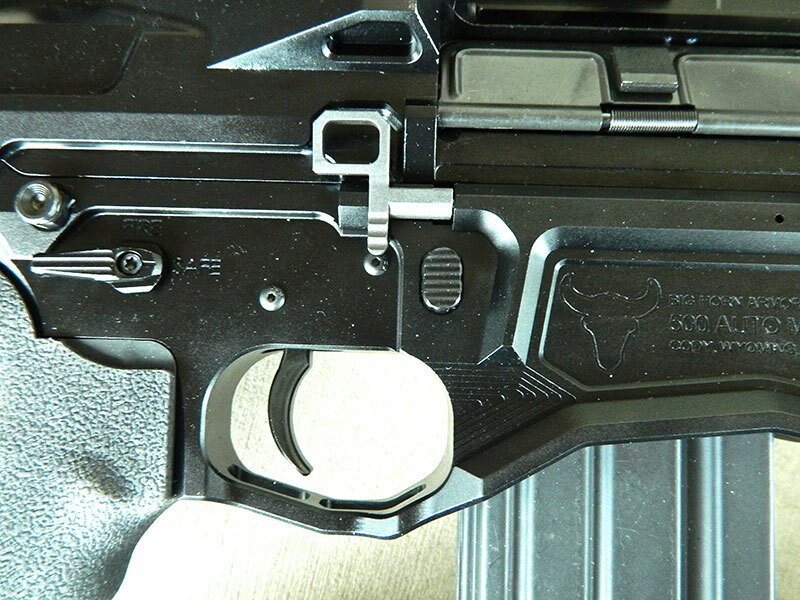 Rifle features enlarged trigger guard. Rather than normal narrow slots found on flash suppressors, AR500’s flash suppressor has relatively large oblong slots. 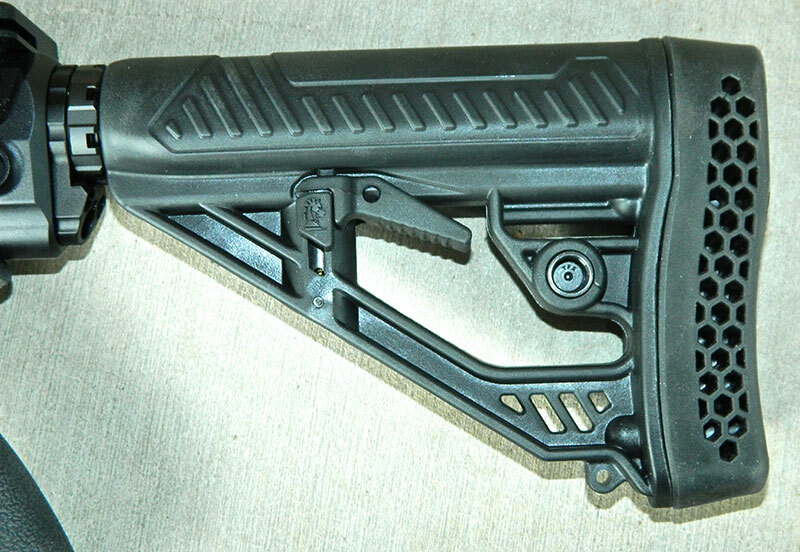 QD sling sockets are on both sides of six-position adjustable buttstock. Rifle uses popular Ergo Grip pistol grip. Short rail segments at three, six, and nine o’clock at muzzle end of handguard can be used to attach lights, lasers, bipod, etc. 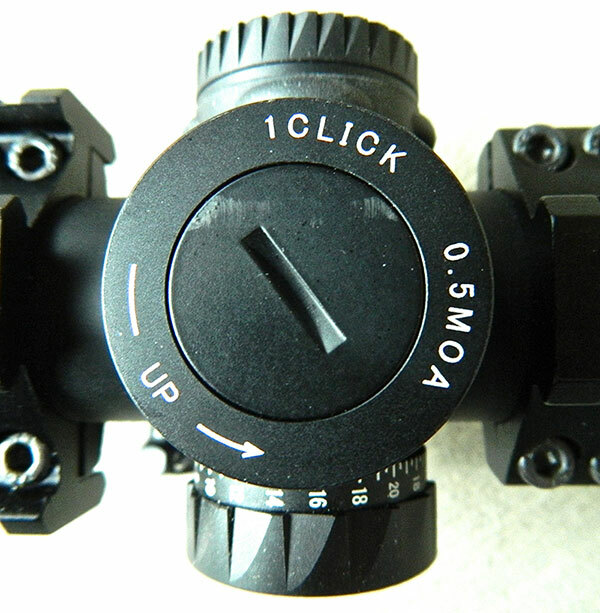 EOTech Vudu 1-6X Precision Rifle Scope was used to evaluate AR500. Windage and elevation adjustments on EOTech Vudu scope are in .5 MOA increments, with total adjustment range of +/- 50 MOA windage and elevation adjustment. Six rounds from 75 yards prone. Author called “flyer” at three o’clock. The AR-15/AR-10 platform has been chambered for more cartridges than any other firearm in history. It’s time to add another to the list—the 500 Auto Max used in Big Horn Armory’s AR500. Now and for the foreseeable future, it is the most powerful short-range semi-auto in the world. Based on a .308/AR-10 lower receiver, the AR500 has an 18-inch barrel with 1:24 twist and adjustable gas block. The rifle has a full-length Picatinny rail, M-LOK compatible handguard, six-position adjustable buttstock, and flash suppressor. With the stock fully collapsed, overall length is 37 inches, and the rifle weighs nine pounds empty on my scale. The bolt release and safety selector are ambidextrous and it has an enlarged trigger guard. 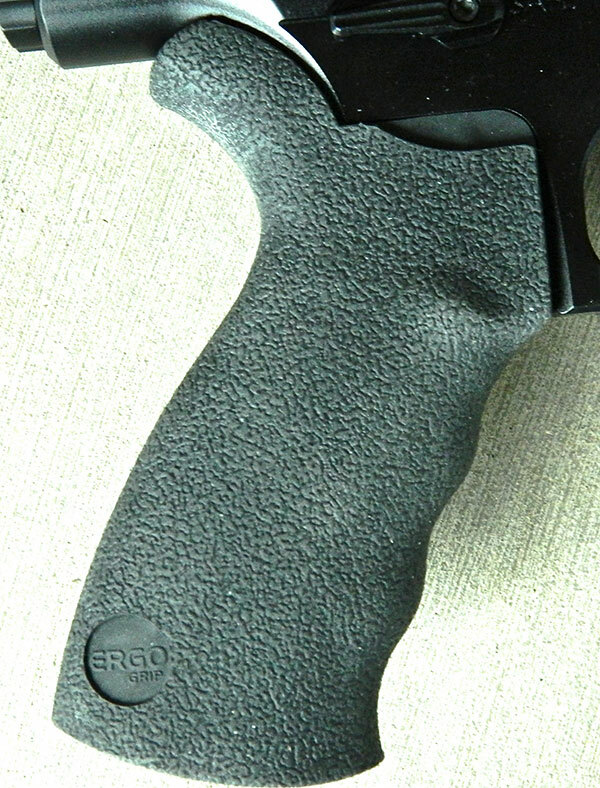 The AR500 uses an Ergo Grip pistol grip. The flash suppressor has two relatively large, oblong slots at 12, three, six, and nine o’clock. 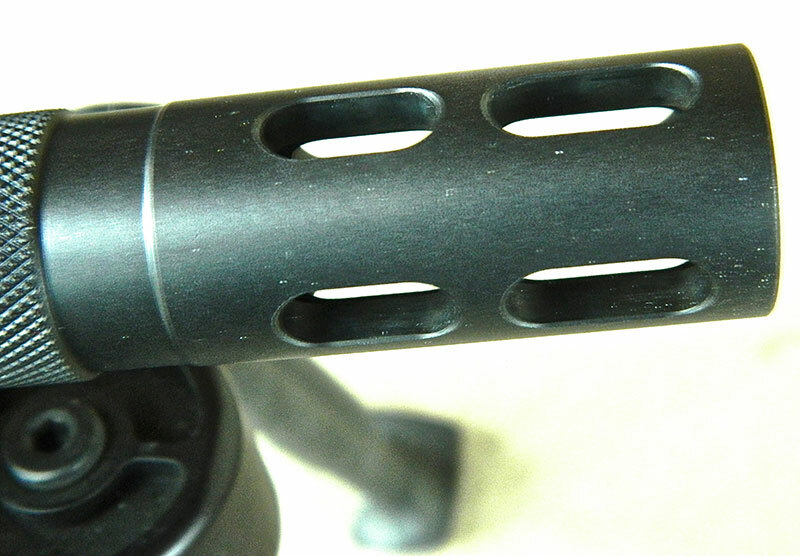 The rail slots on the handguard are numbered, but the slots on the upper receiver are not. I would like to see the slots on the upper numbered, as that is where optics are normally installed and removed. 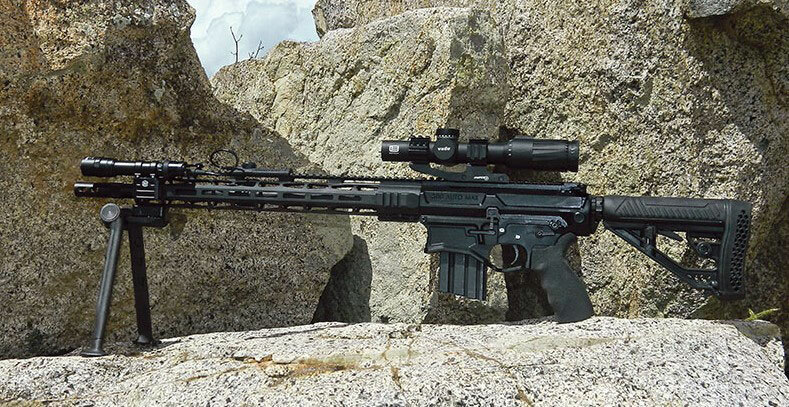 In addition to the full-length top rail, short rail segments are at three, six, and nine o’clock at the muzzle end of the handguard and three and nine o’clock on the handguard just forward of the upper receiver. 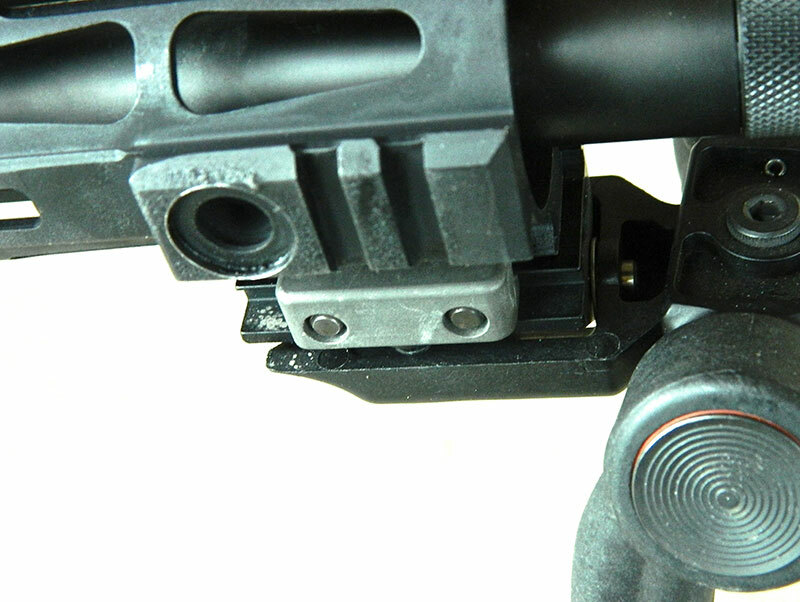 Sockets for quick-release sling attachments are on both sides at the end of the stock, the rear of the lower receiver, and on the three and nine o’clock rail segments near the muzzle. Big Horn Armory included a black leather Rhodesian sling with the sample rifle. Thankfully missing from the lower receiver is the useless forward assist. I have seen the forward assist exacerbate a problem but have yet to see it solve one. The AR500 utilizes a proprietary five-round magazine and comes in a hard-plastic case. No sights are provided with the rifle. Big Horn Armory has worked closely with Leupold and EOTech on optics, and I was furnished with an EOTech scope. The 500 Auto Max is a rimless 500 S&W Magnum. Big Horn Armory kindly furnished me with over 100 rounds of 440-grain hard-cast, flat-nose 500 Auto Max. To put that in perspective, a one-ounce 12-gauge slug weighs slightly less, coming in at 437.6 grains. The big, heavy bullet leaves the muzzle at approximately 1,900 feet-per-second (fps), generating 4,100 foot-pounds of energy. It’s enough gun for elk and elephants. 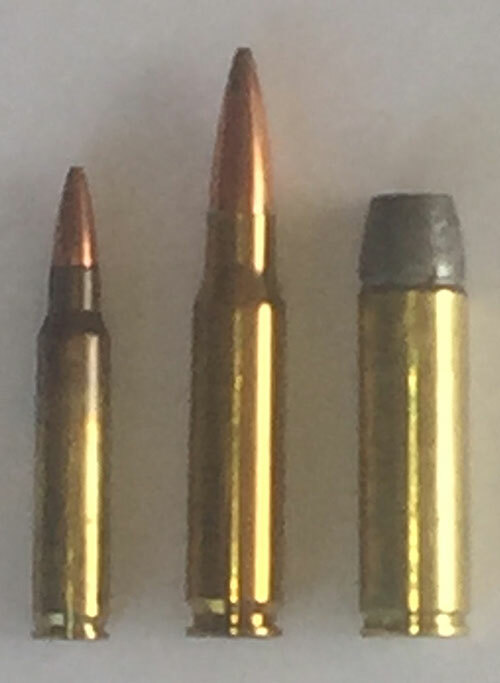 In a law enforcement role, three hits on target are roughly equal to the .50 BMG round and thus will stop anything from a Pinto to a Peterbilt at a roadblock. Although Greg Buchel of Big Horn Armory told me he has hit steel at 1,000 with the AR500, the effects of gravity on the heavy slug cause it to lose velocity—and thus energy—quickly, and so the effective range is probably closer to 200 yards. The scope Big Horn Armory furnished me with was an EOTech Vudu 1-6X Precision Rifle Scope. At low power, the EOTech Speed ring, which is a small circle inside a larger circle, can be used for fast engagement, while at higher powers, vertical and horizontal stadia lines allow precise shots. The reticle can be illuminated with push buttons located on the battery compartment located on the left side of the tube. It uses common CR2032 batteries with a battery life of around 500 hours. After about two hours, it shuts off automatically to conserve the battery. Adjustments are in .5 MOA increments with a total adjustment range of +/- 50 MOA for both windage and elevation. Overall length is 10.6 inches and weight is 20.1 ounces. The Vudu came pre-mounted in a Sniper PT-30 30mm Cantilever Scope Ring mount. After checking to make sure the screws on the rings were tight, I attached the screws on the base to the AR500 using 40 foot-pounds of torque. I also mounted a SureFire M600DF Scout Light®. The DF stands for Dual Fuel, as it can use either one 18650A lithium ion rechargeable battery or two 123A batteries. The Scout Light comes complete with a charger and both AC and DC power cords. With the 18650A battery, it will produce 1,500 lumens for 1.5 hours. With the 123A batteries, it will give out 1,200 lumens for 1.25 hours. I attached the Scout Light with a SureFire RM45 45° offset mount. One hundred yards is often referred to, quite accurately, as the length of a football field. But a relatively small portion of the population has actually been down on the field. Several people, when we have gone back to 100 yards on my range, have asked, “How far are we from the targets? 200 yards?” The point is that many folks are not good at estimating range. I often hear about the proverbial 300-yard shot on a deer, though a deer often blends in with its surroundings and is very hard to spot at that distance unless it’s moving. In my area, even in summer, there is as much brown and gray in the woods as there is green. I honestly don’t think I’ve shot a deer farther than perhaps 100 yards, and most shots have been around 75 yards. So the AR500’s effective range of 200 yards should not be a hindrance in most cases. What about low magazine capacity? The AR500 was never intended to raid a meth lab, and it holds as much ammo as any other common hunting rifle. For accuracy testing, I decided to shoot from prone at 75 yards using a TangoDown AC bipod. The EOTech Vudu was pretty close, with point-of-impact only four inches low and six inches right. Adjusting elevation and windage at the same time had the scope zeroed, shooting only about ½ inch left and ½ inch right. One six-round group (chamber a round and top off the mag) went into about one-inch, with four rounds basically going through the same hole, one slightly low, and a called “flyer” at three o’clock. If the massive .50-caliber holes were measured center-to-center, it would have been a sub-MOA group. This baby can shoot! I was expecting the rifle to give me somewhat of a push, but felt recoil was pretty tame, being less than that felt by a .308 AR-10. Muzzle blast was negligible. Fully loaded, the magazine slightly swelled at the top, which made it marginally harder to insert than normal. There was enough space in the mag to allow it to be inserted and function under a closed bolt. In the first 25 rounds, I had a few failures to eject. The last round in the magazine often presented too high in the mag to feed reliably. The AR500 is based on the most popular rifle in America, and the 500 Auto Max can take down any animal on the planet. If you’ve been looking for a semiautomatic rifle with superior ergonomics and that packs a punch, your search is over.